Listing of Wellington aircraft and Serial Numbers that served with 311 (Czech) Squadron RAF and 1429 Czech Operational Training Unit RAF between 1940 and 1943. Wellingtons R1410 (KX-M), R1378 (KX-K) and T2561 (KX-A) of 311 Sqn. L4332 ‘K’ I Trans from 214 Sqn to 311 Sqn then to 11 OTU. L4338 ‘E’ I Trans from 214 Sqn to 311 Sqn then to 11 OTU. L4343 I Trans from 15 Sqn to 311 Sqn then to 20 OTU. L7776 IA Del to 311 Sqn then to Central Gunnery School. L7778 ‘U’ IA Trans from 9 Sqn to 311 Sqn – This aircraft took part with two other Wellingtons (L7785 & P9235) in the squadron’s first operation to Brussels 10.9.40. , then to 15 OTU. L7785 ‘R’ IA Trans from 9 Sqn to 311 Sqn – This aircraft took part with two other Wellingtons (L7778 & P9235) in the squadron’s first operation to Brussels 10/09/40, then to Central Gunnery School . L7786 IA Trans from 9 Sqn to 311 Sqn – Hit power cables and crashed at Pipps Farm, Coddenham near Needham Market on 17/10/40, whilst on a training flight; Sgt Karel Lang (k); Sgt Oldrich Tosovsky (k). L7788 ‘E’ IA Trans from 9 Sqn to 311 Sqn – Missing 24/09/40.from an operation to Berlin. Aircraft made a forced landing at Leidschendam in Holland. The crew initially went on the run but were soon captured and became prisoners of war; P/O Vaclav Killian (pow); P/O Zdenek Prochazka (pow); P/O Karel Trojacek and Sgt Arnost Zabrz (pow); Sgt Karel Kunka later took his own life because he feared his capture might endanger his family in Czechoslovakia. The aircraft was recovered by the Germans and test flown. L7806 IC Trans from 149 Sqn to 311 Sqn then to 18 OTU. 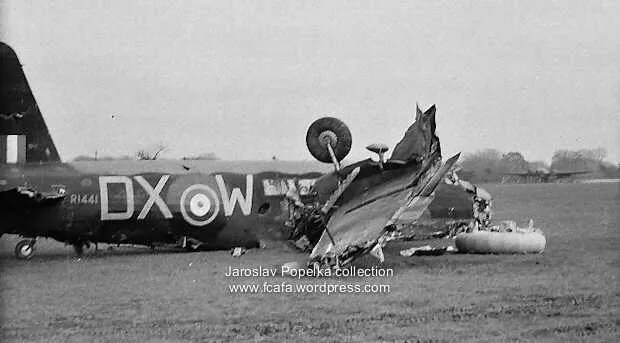 L7841 ‘S’ IC Del to 311 Sqn – then to Czech Training Flight then to 1429 Flt Aircraft crashed during a training flight with a student pilot, whilst overshooting at East Wretham 24/02/42. The aircraft had engine control problems and the starboard wing caught the ground on the boundary. The aircraft bellied onto the grass, fortunately the crew were able to get clear. The rear gunner was thrown out of his turret and injured his back. Instructor was P/O Josef Capka. L7842 ‘T’ Del to 311 Sqn – Aircraft took off at 1806 hours from East Wretham for a raid on Boulogne 6/02/41.The crew bombed the target but became disorientated through navigational error and bad weather. Eventually with the fuel exhausted they made a forced landing in France and both they and the aircraft were seized by the Germans. P/O Frantisek Cigos (pow); P/O Emil Busina (pow); P/O Karel Krizek (pow); P/O Arnost Valenta (pow); Sgt Gustav Kopal (pow); Sgt Petr Uruba (pow). (Valenta was one of those later shot by the Gestapo for his part in the ‘Great Escape’ from Stalag Luft III at Zagan). The aircraft was salvaged by the Luftwaffe and taken to Rechlin for tests and evaluation. L7844 ‘T’ Del to 311 Sqn,- Missing Raid on Kiel 16.10.40 (P/O Hubert Jarosek (k); P/O Bohumil Landa (k); Sgt Otto Jirsak (k); Sgt Karel Klimt (k), Sgt Emanuel Novotny (pow); Sgt Augustin Sestak (pow). Aircraft took off at 1850 hours and was reported shot down in the Zujder Zee by the captain of Hampden near by. This is probably the Wellington bomber claimed shot down that night by Lt Ludwig Becker of 4/NJG1 near Oosterwolde, Gelderland at 2125 hours. L7847 Trans from 99 Sqn to 311 Sqn then to Czech Training Flight then to ATA. L7852 Del to 311 Sqn then to 9 Sqn. L7895 Del to 311 Sqn then to 115 Sqn. N2752 IC Trans from 15 Sqn to 311 Sqn then back to 15 Sqn. 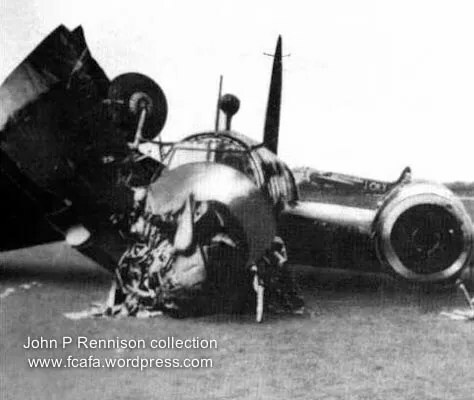 N2771 ‘H’ IC Del to 311 Sqn, Crashed Bentley Priory after taking off for a raid on Kiel 17/10/40; aircraft became iced up, suffered radio failure and the crew were unable to obtain an accurate fix, which all contributed to the aircraft crashing. Sqn/Ldr Jan Vesely (k); P/O Jaroslav Matousek (k); P/O Jaroslav Slaby (k); Sgt Frantisek Zapletal (k); Sgt J osef Albrecht (k); P/O Frantisek Trular suffered serious burns, but survived and later became a fighter pilot. N2772 ‘J’ IC Del to 311 Sqn, then to 21 OTU then to 1429 Flt then to 1474 Flt. N2773 ‘K’ IC Del to 311 Sqn – Captain Flt\Lt Josef Snajdr; Abandoned in the air at 0322 hours on 17/10/40.and came down at Blidworth, ten miles NNE of Nottingham returning from raid on Bremen, in bad weather with no radio and fuel exhausted. P/O Miloslav Vejrazka, the wireless operator was killed, when his parachute failed to open. N2775 IC Trans from 149 Sqn to 311 Sqn then to 1429 Flt then to ATA. N2871 IC later converted to Mk. VIII Trans from 15 Sqn to 311 Sqn then to 12 OTU. N2880 IC later converted to Mk. VIII Trans from 38 Sqn to 311 Sqn then to Central Landing Establishment. N2885 Trans from 115 Sqn to 311 Sqn then to 20 OTU. N2938 Trans from 57 sqn to 311 Sqn then to 12 OTU. N3000 Trans from 40 sqn to 311 Sqn then to 12 OTU. N3007 Trans from 214 sqn to 311 Sqn then to 20 OTU. N3237 ‘C’ Trans possibly from 19 Squadron to 1429 Flt – Took part in the second 1,000 raid on Essen 01/06/42.). N3010 ‘L’ Trans from 214 Sqn to 311 Sqn – Swung on take off and hit trees on take off from Langham. (Sgt Frantisek Dusek (k); F/Sgt Milan Stocek (k); P/O Stanislav Zeinert (dil); P/O Miroslav Svic (dil) 25/05/41. P2525 IA Trans from 214 Sqn to 311 Sqn then to 15 OTU. P9209 IA Trans from 75 Sqn to 311 Sqn then to 57 Sqn. P9212 IA Trans from New Zealand Flight (later 75 Sqn) to 311 Sqn – Struck tree and crashed on approach to Honington after engine failure on 16/04/41. P9224 IA Trans from 115 Sqn to 311 Sqn then to Czech Training Flight then to 5 Group Training Flight. P9226 ‘Z’ IA Trans from 115 Sqn to 311 Sqn – Damaged by enemy intruder at 2210 hours on 12/03/41 over the Norfolk coast during a training flight. The pilot of the enemy aircraft was probably Fw Heinz Mittelstat of 2/NJG2 – then to 12 OTU. P9230 ‘B’ then ‘X’ IA Trans from 115 Sqn to 311 Sqn – Attacked by an enemy intruder at 2250 hours on 09/04/41 whilst on a training flight. The enemy aircraft was a Ju.88 from NJG2. The captain of the Wellington, P/O Jan Hrncir was wounded in the head and the trainee pilot W/O Nyc took over and landed the aircraft. The enemy pilot was probably Hptm Karl Hulshoff, who claimed a Wellington shot down some 30 miles to the east of Bridlington (Hulshoff also attacked an unidentified Hampden off Scarborough some ten minutes later), then to Central Gunnery School. P9235 ‘C’ IA Trans from 115 Sqn to 311 Sqn – This aircraft took part with two other Wellingtons (L7778 & L7785) in the squadron’s first operation to Brussels 10/09/40, then to RAE. P9280 IC Trans from 40 Sqn to 1429 Flt then to 30 OTU. 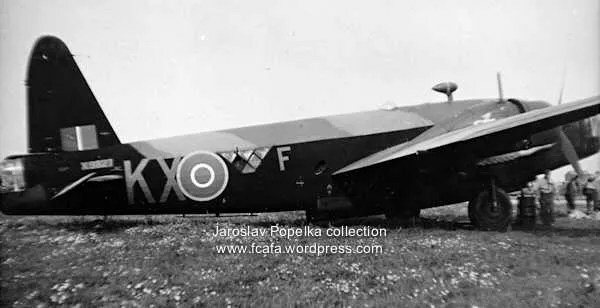 P9299 ‘A’ IC Trans from 218 Sqn to Czech Training Flight then to 1429 Flt – Flew into high ground in bad weather 06/04/42 near Llanymawddy on the River Dovey; 787831 Sgt Rudolf Grimm (k); 787929 Sgt Jindrich Horinek (k); 788087 Sgt Aldis Keda (k); 787880 F/Sgt Jan Stanovsky (k); 787584 Sgt Rudolf Vokurka (k); P/O Jan Stefek (k). R1015 ‘L’ IC Del to 311 Sqn – Made forced landing at Church Fenton returning from raid on Hamburg 26/04/41 Captain Sgt Jaroslav Doktor. Missing raid on Hamburg 15/09/41. Nothing was heard after take off at 1955 hours. P/O Mojmir Sedlacek (k); P/O Antonin Zimmer (k); Sgt Vilem Soukup (k); Sgt Jan Miklosek (k); Sgt Alois Jarnot (k); Sgt Zdenek Babicek (k). This aircraft was possibly the Wellington claimed as shot down by Gfr Rudolf Frank of I/NJG3 north west of Meppen at 2330 hours. R1021 ‘W’ IC Del to 311 Sqn – then to 11 OTU. R1022 ‘K’ IC Del to 311 Sqn – Following a raid on Bremen on 02/01/41. Captain P/O Antonin Kubiznak, the aircraft landed back at base with 11 holes caused by flak and the front gunner Sgt Bolfik had his flying boot slashed by a splinter – then to 11 OTU. R1034 IC Del to 311 Sqn then to 115 Sqn. R1046 ‘E’ then ‘X’ IC Trans from 214 Sqn to 311 Sqn – Missing from a raid on Bremen 20/10/41 Aircraft. took off at 1855 hours, nothing was heard until an SOS was received at 2201 hours. Following engine problems the aircraft came down on a sandbank 4½ miles south of Schiermonnikoog in the Frisian Islands. The crew were later picked up and became prisoners of war. P/O Erazim Vesely (pow); Sgt Frantisek Petr (pow); Sgt Vaclav Prochazka (pow); Sgt Josef Suza; Sgt Bedrich Valner (pow) and Sgt Josef Zvolensky (pow). R1137 IC Del to 311 Sqn then to the Service Ferry Pool. 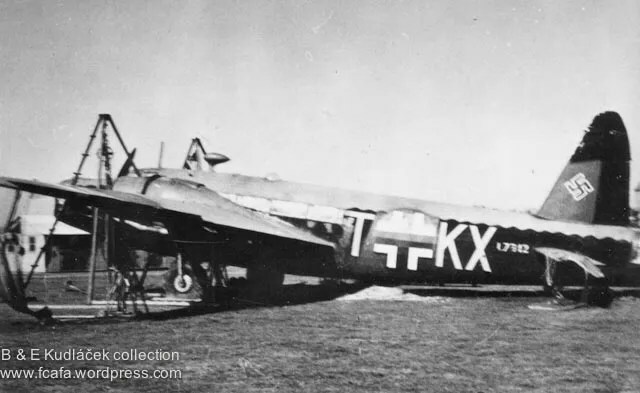 R1161 ‘X’ IC Trans from 75 Sqn to 311 Sqn – During a raid on Hamburg on 27/10/41 the aircraft lost a propeller, but pilot (Sgt Jan Lenc) managed to get the aircraft back to base – then to 105 OTU. R1225 IC Del to 311 Sqn then to 9 Sqn. R1228 IC Trans from 305 Sqn to 311 Sqn then to 21 OTU. R1240 ‘F’ IC Trans from 40 Sqn to 1429 Flt – then to 27 OTU – Took part in the second 1,000 raid on Essen on 01/06/42. R1269 ‘G’ IC Trans from 115 Sqn to 1429 Flt – then to 22 OTU. (Note whilst with 1429 Flt this aircraft took part in the first 1,000 raid on Cologne and the second 1,000 raid on Essen in 1942). R1371 ‘F’ IC Del to 311 Sqn – Missing 20/07/41 from a raid on Hannover. Aircraft took off at 2252 hours from East Wretham and crashed at Waddenzee. The aircraft was observed in combat with an enemy fighter. Both were seen to crash into the sea. Sgt Pavel Babacek (m); Sgt Jan Ctvirtlik (m); Sgt Vaclav Vales (m); Sgt Miroslave Jindra (k); Sgt Vaclav Netik (k); P/O Partyk (k) his body was later recovered and is buried at Sage War Cemetery. R1378 ‘K’ IC Del to 311 Sqn – On returning from a raid on Bremen the aircraft made a crash landing at East Wretham 18/05/41 following a fire in the starboard engine. Captain was Sgt Leo Anderle. Hannover on 15/05/41 and the port engine caught fire at 14,000 feet, this was extinguished and the aircraft was flown back to England on one engine. At 0600 hours a belly landing was made 11 miles south of Manningtree. The starboard engine cut out on touch down as the fuel supply was exhausted. The captain was Flt/Lt Josef Snajdr; The aircraft was later recovered and eventually transferred to 12 OTU. R1441 ‘W’ IC Del to 311 Sqn – Struck trees on approach at East Wretham 28/03/41. R1451 ‘P’ IC Del to 311 Sqn. During a raid on Munster on 05/07/41 this aircraft (Captain F/Sgt Karel Schor) was attacked by a night-fighter on two occasions. The rear gunner Sgt Kadlec, returned the fire and claimed to have hit the enemy aircraft. Unfortunately he himself was badly wounded in a leg (which later had to be amputated). The aircraft had also been hit by enemy flak and had a large hole in the starboard wing and flap, together with holed fuel tanks. The pilot did however, manage to make a safe landing back at base despite the additional problem of a punctured tyre. It is possible that this Wellington was attacked by Ofw Wilhelm Beier of 3/NJG2 (see R1532 below). The aircraft was later transferred to 18 OTU. R1458 ‘Z’ IC 311 Sqn – then to 1 AAS. R1466 ‘D’ IC Del to 311 Sqn – On returning from a raid on Hanover on 15/04/41 the the captain Sgt Frantisek Fencl had to make a forced landing at Thurleton south west of Great Yarmouth due to a lack of fuel caused by three flak holes in the tanks – then to 75 Sqn. R1497 IC Trans from 218 Sqn to 311 Sqn then to 4261M 10/43. R1516 ‘U’ IC Del to 311 Sqn – Aircraft was involved in a combat with an enemy fighter on 05/05/41 during a raid on Mannheim. After an exchange of fire the enemy aircraft dived away and disappeared into cloud. Aircraft Took off at 2202 on 01/07/41 hours for a raid on Cherbourg. Shot down in error by RAF night-fighter 02/07/41 at Lower Park Farm near Mere in Wiltshire. 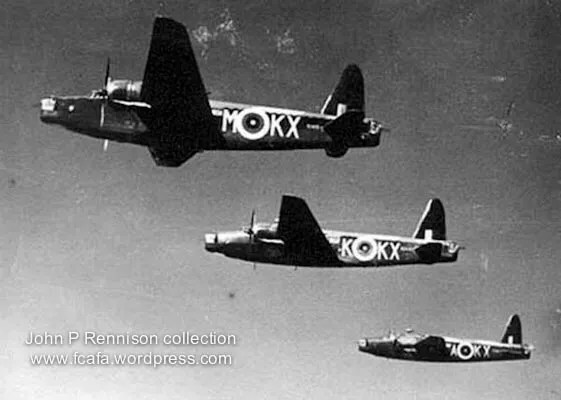 Sgt Oldrich Helma (k); Sgt Adolf Dolejs (k); P/O Richard Hapala (k); Sgt Antonin Plocek (k); Sgt Jaroslav Petrucha (k); Sgt Jaroslav Lancik (k).The aircraft is thought to Have been shot down by F/O John Cunningham in a Beaufighter of 604 Sqn. R1523 IC Trans from 3 PRU to 311 Sqn then to 20 OTU. R1532 ‘R’ IC Del to 311 Sqn – During a raid on Munster on 05/07/41, this aircraft (Captain F/Sgt Josef Bernat) was attacked by a night-fighter. Incendiary bullets set fire to the port wing fabric and the aircraft interior. The fire was extinguished by the navigator and the wireless operator. The enemy aircraft then made two further attacks, during which the hydraulic system of the rear turret was damaged and the turret had to be manipulated by hand. The rear gunner claimed hits on the enemy aircraft, which was seen diving away. Due to the damage to the hydraulic system, the undercarriage could not be lowered and the flaps were not functioning. A belly landing was made at East Wretham and apart from bumps and bruises the crew were uninjured. It is possible that R1532 was attacked by Ofw Wilhelm Beier of 3/NJG2, who claimed to have downed a Wellington north north west of Texel at 0308 hours. The aircraft was later transferred to 27 OTU. R1594 IC Trans from 218 Sqn to 311 Sqn – Lost 27/06/41. R1598 ‘C’ IC Del to 311 Sqn – then to 3 OTU. R1599 ‘J’ IC Del to 311 Sqn – Aircraft took off at 2055 for a raid on Cologne 17/04/41.Nothing further was heard other than an SOS sent shortly after the aircraft came under attack by an enemy fighter. The aircraft had carried out the bombing sortie and was returning to base when it came under attack and was shot down by Hptm Werner Streib of St1/NJG1 5 miles East of Weert in the Netherlands at 2339 hours. P/O Vaclav Kosulic (k); Sgt Frantisek Kracmer (k); F/O Vladimir Kubicek (k); Sgt Rudolf Lifczicz (k); F/O Frantisek Sixta (k); Sgt Vaclav Stetka (k). R1600 ‘T’ IC Trans from 11 OTU to 311 Sqn – (converted to Mk.V111) then to 232 Sqn. R1718 ‘N’ IC Del to 311 Sqn – Missing Raid on Hamburg 17/07/41. The aircraft took off at 2307 hours and nothing was heard thereafter. It was attacked by an enemy night fighter. The crew baled out, although the pilot, F/Sgt Jaroslav Nyc, was momentarily trapped by a jammed hatch, but was able to break free and take to his parachute. He was captured by the Germans and became a prisoner of war as did the rest of the crew; P/O Otakar Cerny; P/O Jaroslav Zafouk; Sgt Frantisek Knap and Sgt Karel Stastny. Sgt Jiri Mares, the rear gunner, was drowned in the Zuider Zee after baling out of the stricken aircraft. The enemy fighter was probably a Messerschmitt Me.110 from 4/NJG1, being flown by Lt Rudolf Schoenert. He claimed to have shot down a Wellington at 0050 hours just west of Lemmer. R1771 ‘Y’ IC Trans from 75 Sqn to 311 Sqn then to 1429 Flt – then to 311 Sqn – then to 1429 Flt – then to 6 OTU and thence to 3 OTU. Took part in the second 1,000 raid on Essen on 01/06/42. R1777 IC Trans from 75 Sqn to 311 Sqn then to 1429 Flt then to 311 Sqn then to 1429 Flt then to 6 OTU and thence to 3 OTU. R1802 ‘M’ IC Del to 311 Sqn – This aircraft was badly shot up by an enemy intruder (Ju.88) on 13/08/41 when landing at East Wretham upon return from a raid on Hannover. Three of the squadron’s aircraft were attacked, but no personnel were injured – Aircraft was repaired and later trans to 21 OTU. R1804 ‘D’ IC Del to 311 Sqn Swung on take off for an air test at East Wretham at 1145 hours and hit a steamroller ripping off the starboard wing and crushing the fuselage. The captain of the aircraft was F/O J Stransky and the crew all survived the incident 19/07/41. R3166 IC Trans from 75 Sqn to 311 Sqn then to 21 OTU. R3177 ‘L’ IC Del to 311 Sqn – Lost 28/10/40. No further information is available. R3206 IC Trans from 149 Sqn to 311 Sqn then to 1429 Flt then to 27 OTU. R3218 IC Trans from 75 Sqn to 311 Sqn then to 1429 Flt. R3221 ‘O’ IC Trans from AAEE to 311 Sqn – Aircraft crash landed at Stradishall in Norfolk following instrument trouble 09/41 – then to 301 FTU. R3230 IC Del to 311 Sqn then to 9 Sqn. R3234 IC Del to 311 Sqn then to 1429 Flt. R3237 IC Del to 311 Sqn (Converted to MkXVI) to 1429 Flt (06/41)then to 5 FP. R3277 IC Del to 311 Sqn then to 75 Sqn. R3286 IC Trans from 9 Sqn to 311 Sqn then to Czech OTU then to 1429 Flt then to 29 OTU. T2467 IC Del to 311 Sqn then to 27 OTU. T2468 IC Trans from 10 Sqn to 311 Sqn then to 1429 Flt. T2469 IC Del to 311 Sqn then to 214 Sqn. T2519 ‘Y’ IC Del to 311 Sqn – Took off at 1750 hours for a raid on Wilhelmshaven 16/01/41 probably came down in the North Sea. Last message was an SOS at 2218 hours (F/O Josef Hudec (m): P/O Jaromir Kral (m); P/O Antonin Kubiznak (m); P/O Jindrich Leskauer (m); Sgt Bohuslav Baumruk (m); Sgt Rudolf Bolfik (m).Aircraft was believed to have been experiencing engine trouble. T2553 ‘B’ IC Del to 311 Sqn – Missing Raid on Wilhelmshaven 27/28/12/41. Aircraft took off at 1716 hours and nothing further was heard. The aircraft came down in the sea some 12 miles south south west of Den Helder and west of Petten in the Netherlands. Sgt Alois Siska, P/O Josef Scerba and Sgt Pavel Svoboda survived and became prisoners of war. F/O Josef Mohr (k); Sgt Rudolf Skalicky (k); Sgt Josef Tomanek (k).F/O Mohr’s body was later recovered and he is buried in Bergen General Cemetery. 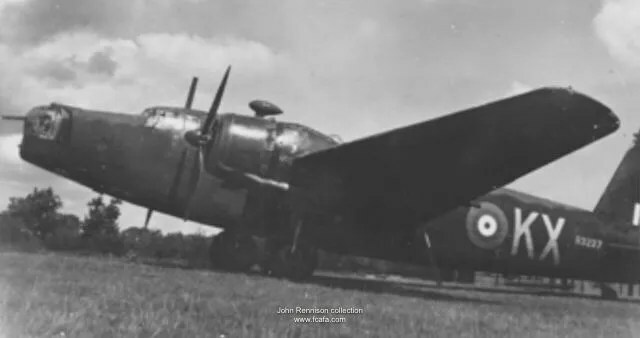 It is possible that the Wellington was the aircraft claimed as shot down by Oblt Prinz zur Lippe-Weissenfeld of 5/NJG2, south west of Petten at 2146 hours. Weissenfeld claimed to have downed a Whitley, but that could be simply a case of poor target identification in the darkness and the excitement of the moment. T2561 ‘A’ IC Del to 311 Sqn – then to 20 OTU. T2564 ‘T’ IC Del to 311 Sqn – then to 9 Sqn, then back to 311 Sqn – Attacked by a single Ju.88 of Kg.40 on 18/08/42. at position 44.30N 08.20W. Captain F/O Frantisek Taibr. This aircraft was again attacked by two Ju.88s in position 47.45N 07.40W at 1630 hours on 15/09/42 over the Bay of Biscay. Captain F/O Frantisek Taibr. Aircraft later crashed ½ mile east of Northolt on 18.10.42.The aircraft was carrying a number of aircrew and ground staff from the squadron (the crews of P/O Bulis and Flt/Lt Student, who were to attend a series of interviews at Coastal Command regarding anti submarine operations). The aircraft stalled and crashed just short of the runway at Northolt killing all on board. F/Sgt Jan Blaha (k); P/O Frantisek Bulis (k); .P/O Antonin Bunzl (k); Sgt Josef Cech (k); F/Sgt Frantisek Dolezal (k); P/O Bedrich Gissubel (k); Sgt Wilem Gotzlinger (k); Flt/Lt Vaclav Hanka (k); P/O Jaroslav Jebacek (k); Cpl Frantisek Paclik (k); Sgt Vladimir Rajecki (k); F/Sgt Frantisek Stoklasek (k); Flt/Lt Vaclav Student (k); F/Sgt Josef Svec (k); P/O Lymans (MTO Talbenny) (k). T2577 ‘Q’ IC Del to 311 Sqn – Crashed after striking trees following take off from East Wretham for raid on Manheim 16/12/40 (P/O Jaromir Toul (dil); Sgt Jan Krivda (k); Sgt Jiri Janousek (k); P/O Vladimir Nedved (s); Sgt Doubrava (s). Nedved affected the rescue of Doubrava and Toul and was later awarded the MBE for his gallantry). T2578 IC Del to 311 Sqn then to 9 Sqn. T2613 IC Del to 311 Sqn then to 115 Sqn. T2624 IC Trans from 15 Sqn to Czech Training Flight then to 311 Sqn – Ditched Irish Sea off Cardigan 23/10/41. whilst on a cross country flight (Base -Llangollen-Maughold Head-10 miles-Aberystwyth-Banbury-Base) Sgt Karel Hurt (m); Sgt Otakar Januj (m); Sgt Jaroslav Polednik (m); Sgt Jaroslav Rolenc (m); The body of P/O Frantisek Dittrich was washed ashore on 31/10/41. T2716 IC Del to 311 Sqn then to 40 Sqn. T2739 IC Trans from 218 Sqn to 311 Sqn then to 21 OTU. T2962 Trans from 57 Sqn to 311 Sqn then to 21 OTU. T2971 ‘J’ IC Del to 311 Sqn – Attacked by an enemy night-fighter on return from a raid on Dusseldorf. The fire was returned but no claims were made by the crew. Captain was Sgt Jindrich Svoboda. Aircraft took off at 1800 hours for a raid on Bremen 18/01/42 and initially encountered icing over the North Sea. The aircraft crashed north east of Tilburg at 2317 hours, possibly as a result of flak damage. Sgt Karel Batelka, Sgt Zdenek Sichrovsky and Sgt Josef Snajdr were all taken prisoner and P/O Jaromir Broz, Sgt Rudolf Masek and Sgt Jindrich Svoboda were all killed. T2972 ‘G’ IC Del to 31 Sqn – then to ATA. T2990 ‘T’ IC Del to 311 Sqn – Missing Raid on Bremen 22/23/06/41. Aircraft took off at 2316 hours and is believed to have been shot down by Oblt Prinz zur Lippe Weissenfeld of 4/NJG1. The aircraft came down at 0213 hours in the Kostverloren Polder at Niewe Niedorp, north east of Alkmaar in the Netherlands. P/O Leonhart Smrcek (m); F/Sgt Alois Rozum (m); F/Sgt Karel Valach (m); Sgt Jan Hejna (m); the pilot F/Sgt Vilem Bufka survived and became a prisoner of war..
W5668 ‘T’ IC maybe later to VIII Trans from 304 Sqn to 311 Sqn – then to 1429 Flt. W5682 ‘Y’ IC maybe later to VIII Del to 311 Sqn – Aircraft took off at 0340 hours on 10/01/42 from East Wretham for an operation to Brest. Unable to locate the target, the crew decided to return to base. An engine failed and after jettisoning the bomb load a forced landing was made some 2 miles from Tavistok at 0615 hours. Whilst coming in to land the aircraft hit a haystack. Sgt Jiri Fina and his crew of Sgt Mazurek, F/O Slama, Sgt Svoboda, Sgt Sipula and Sgt Raiskup, were all safe. W5711 ‘G’ later ‘H’ IC maybe later to VIII Del to 311 Sqn – Crash landing 15/09/42 – then to 105 OTU. X3178 ‘P’ IC Trans from 21 OTU to 311 Sqn – then struck off charge. X3221 ‘O’ IC Del to 311 Sqn – This aircraft crashed near Stradishall in Norfolk in September 1941 following instrument trouble (Captain was Sgt Metodej Sebela). Aircraft was later transferred to 57 Sqn. X3281 Trans from 9 Sqn to 311 sqn then back to 9 Sqn. X9614 ‘Q’ IC 311 Sqn – then to 11 OTU. X9664 ‘K’ IC Trans from 304 Sqn to 311 Sqn then to 21 OTU. X9733 IC Trans from 149 Sqn to 311 Sqn then to 105 OTU. X9741 ‘D’ IC Del to 311 Sqn then to 1505 Flt. X9742 IC Del to 311 Sqn then to 75 Sqn. X9745 ‘S’ IC Trans from 218 Sqn to 311 Sqn then to 303 Ferry Training Unit. X9760 ‘O’ IC Trans from 57 Sqn to 311 Sqn then struck off charge. X9787 ‘G’ IC Trans from 156 Sqn to 311 Sqn – Missing Essen 02/06/42. X9803 IC Trans from 11 OTU to 311 Sqn then to 1473 Flt. X9806 ‘R’ IC Trans from 75 Sqn to 311 Sqn – then to 1429 Flt – Aircraft made a forced landing at RAF Grantham following prop failure on 08/05/42.Captain Sgt Jan Irving. X9827 ‘F’ IC Trans from 304 Sqn to 311 Sqn – This aircraft had an exchange of fire with a Whitley on 31/07/42. No damage or casualties resulted – then to 303 Ferry Training Unit. X9871 ‘A’ IC Trans from 150 Sqn to 311 Sqn then to 22 OTU. X9877 IC Trans from 149 Sqn to 311 Sqn then to 7 OTU. X9880 C IC Trans from 156 Sqn to 311 Sqn then to 21 OTU. X9888 IC Del to 311 Sqn then to 115 Sqn. Z1068 ‘T’ IC Trans from 214 Sqn to 1429 Flt – then to 27 OTU. (Note; whilst with 1429 Flt this aircraft took part in the first 1,000 raid on Cologne and the second 1,000 raid on Essen in 1942). Z1070 ‘Y’ IC Trans from 218 Sqn to 311 Sqn – Missing from an operation to Billancourt France on 01/03/42. Aircraft took off at 1819 hours and crashed in the area of Creil. Sgt Bohuslav Hradil (k); Sgt Janich Kotrch (k); Sgt Alois Tolar (k); Sgt Josef Svoboda (k); Sgt Imrich Kormanovic (k); Sgt Pribyslav Strachon (k). Z1090 ‘Q’ IC Trans from ? to 311 Sqn – Aircraft struck a building and crashed at Brancaster Beach, Norfolk on 25/06/42. after take off from Bircham Newton at 2327 hours, to take part in ‘Operation Millenium’ the 1,000 raid on Bremen. Fourteen aircraft from 311 Sqn were involved and 11 attacked the target. The crew of Sgt V Zezulka, F/Sgt M Cervinka, Sgt J Holna, Sgt A Jelinek, Sgt Z Janda and Sgt K Kriz abandoned the aircraft and took to their dinghy, although they were relatively close to the shore. Z1098 ‘U’ IC Del to 311 Sqn – Took off at 2225 hours on 14/04/42 for raid on Dortmund. Aircraft crashed at 0410 hours on 15/04/42 at Boshoven, Limburg, 2 miles west of Weert in Holland. The aircraft was probably shot down by Uffz Walter Schienbein of 2/NJG1 who claimed to have shot down a Wellington at 0400 hours in the area of Boshoven/Limburg. Sgt Vladimir Para (pow); Sgt Oldrich Havlik (k); F/O Milan Zapletal (pow); Sgt Josef Talab (k); Sgt Pavel Varjan (k); Sgt Jaroslav Klavana (pow). Z1105 ‘E’ then ‘R’ IC Del to 311 Sqn – Ditched near Rams Island, Lough Neagh, Ireland 20/05/42. Z1111 in 311 Sqn Coastal Command livery. Z1110 ‘N’ IC Del to 311 Sqn (N) – then to 101 Sqn. Z1111 ‘N’ IC Del to 311 Sqn – This aircraft was involved in the testing of the ASV MkII Radar – then to 7 OTU. Z1131 IC Possibly Del to 311 Sqn (No further detail). Z1147 ‘T’, ‘G’ then ‘Q’ IC Trans from 57 Sqn to 311 Sqn – Whilst under the command of F/O Student on 27/9/42, this aircraft took off to commence a patrol over the Bay of Biscay at 1413 hours. During the patrol a fully surfaced U-Boat, the U-165 (under the command of Frg.Kpt Eberhard Hoffman, was sightedand attacked west of Lorient. The aircraft dived on the submarine from 1,200 feet and six depth charges were dropped from 70 feet, straddling the conning tower. The submarine opened fire with its onboard armament, the Wellington being twice damaged by shrapnel with nearly all the crew being wounded. The rear gunner fired 400 rounds and hit the conning tower many times. The explosions of the depth charges appeared to lift the U-165 bodily, but it still managed to dive slowly, only submerging completely one minute after the DP attack. Owing to their injuries the crew decided to leave the scene of the attack immediately, climbing to 500 feet and setting course for St Eval in Cornwall. Due to the damage from the AA fire the hydraulic system was out of action and the aircraft unable to lower its undercarriage, made a forced landing at St Eval at 1958 hours.The crew had the following injuries; second pilot (F/Sgt Svec), splinter wounds to right leg; navigator (F/O Kadane), splinter wounds to both legs; W/Op (P/O Bunzl), splinter wounds to right arm; front gunner (Sgt Karas), small finger of left hand shot away. Both Kadane and Karas were hospitalised. The U-Boat sank at position 47.00N 05.30W and there were no survivors from the 51 man crew. During a raid on Emden on 04/03/42 the aircraft became involved in a duel with an enemy night-fighter and was badly damaged. The rear gunner Sgt Frantisek Binder was severely wounded and later died. The pilot, Sgt Vladimir Para managed through skilfull airmanship, to escape the enemy aircraft in cloud. The enemy night fighter pilot that carried out the attack was possibly Ofw Paul Gildner of 5/NJG2, who claimed a Wellington shot down north west of Terschellling at 2120 hours. This aircraft later crashed following double engine failure on approach to Pembrey on 25/05/43. Z1155 ‘F’ IC Del to 311 Sqn – Aircraft became embroiled in combat with a single Ju88 (probably from Wekusta 51) on 11/07/42. The enemy aircraft was driven off and later claimed as shot down. However, it apparently managed to return to its base with one of the gunners having been wounded. Missing from anti-submarine sweep on 15/07/42. The Wellington was probably shot down by Fw Henny Passier of IV/KG40 who claimed a Wellington shot down over the Bay of Biscay on this date. Flt/Lt Miloslav Cigler (k); Sgt Hugo Dostal (m); Sgt Josef Holub (m); Sgt Frantisek Novak (k); Sgt Vilem Orlik (k) and Sgt Rudolf Pancir (k).The bodies of Cigler, Novak, Orlik and Pancir were washed ashore some weeks later and are buried at Heanton Punchardon, near Chivenor in North Devon. Z1167 ‘A’ IC Del to 311 Sqn – Missing from raid on Paris 04/03/42 possibly ditched in North Sea or the Channel. The crew consisted of F/O Ladislav Riha (m); Sgt Karel Danihelka (m); Sgt Vladimir Hanzl (m); Sgt Frantisek Janca (m); Sgt Adolf Podivinsky (m); Sgt Dobromil Spinka (m). Aircraft was probably shot down by Ofw Paul Gildner of 5/NJG2, who claimed a Wellington shot down at 2120 hours, north west of Terschelling. Z8787 ‘U’ Del to 311 Sqn – This aircraft carried out at least four training flights and air tests from Honington during September 1941 – then to 21 OTU. Z8805 ‘V’ IC Del to 311 Sqn, then to to 214 Sqn. Z8832 IC Trans from 18 OTU to 311 Sqn then to 304 Sqn. Z8837 IC Trans from 149 Sqn to 311 Sqn then to 25 OTU. Z8838 ‘Z’ IC Trans from 149 Sqn to 311 Sqn – Aircraft took off at 2201 hours (10/04/42) for a raid on Essen. Last message at 0001 hours indicated engine problems. 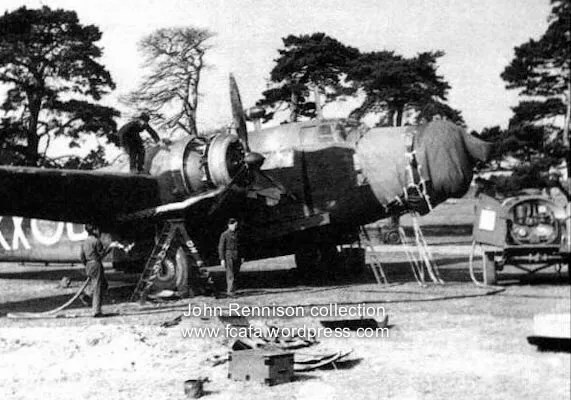 Shortly afterwards the aircraft crashed following an attack by a night fighter, 2½ miles east of Kolhorn in the Northern Netherlands at 0020 hours 11/04/42.The enemy aircraft was probably being flown Hptm Helmut Lent of II/NJG2, who claimed a Wellington shot down at 0023 hours south east of Den Helder.F/Sgt Josef Hrdina (k); F/O Karel Rychnovsky (k); Sgt Josef Kalensky (k); Sgt Karel Kodes (k); Sgt Jan Peprnicek (k); Sgt Josef Politzer (k). Z8845 IC Del to 311 Sqn then to 9 Sqn. Z8853 IC Del to 311 Sqn then to 9 Sqn. Z8854 ‘V’ IC Trans from 75 Sqn to 1429 Flt (Part of 27 OTU) – This aircraft took part in the second 1,000 raid on Essen on 01/06/42. – Later on 13/10/42. It crashed near Scropton, north of Lichfield. Aircraft was on a night training flight, it was seen to circle the airfield (Lichfield) at 2200 hours with navigation lights on. It then flew along the flare path and began to turn slowly to port. However, it failed to come out of the turn, lost height crashed to the ground and burst into flames in Watery Lane Scropton. Flt/Lt Frantisek Fanta (k); Sgt Josef Hrala (k); Sgt Rudolf Jelinek (k); P/O Vaclav Obsil (k); P/O Mucha (k); Sgt Emil Turkel (k). Z8996 ‘E’ IC Del to 311 Sqn – Aircraft took off at 2129 hours on 16/11/41 for a raid on Kiel. Ditched 20 miles south west of St Bee’s Head, Cumberland on as a result of fuel exhaustion when returning. Two of the crew, Sgt Jan Lenc and F/O Engl were rescued; Sgt Stanislav Linka (m); Sgt Jan Parolek (m); Sgt Pavel Skutek (m); Sgt Arnost Vaclavek (m). DV474 ‘Y’ IC Del to 311 Sqn – then to 104 OTU. DV507 ‘W’ IC Trans from 15 OTU to 311 Sqn – Attacked by two Arado 196 floatplanes at position 47.20N 06.30W. one of the enemy aircraft was claimed as shot down the other was driven off – then struck off charge. DV515 ‘D’ IC Del to 311 Sqn – Missing Raid on Bremen 21/01/42. Aircraft took off from East Wretham at 1732 hours and disappeared without trace. Sgt Cenek Kral (m); Sgt Ladislav Nemecek (m); Sgt Miroslav Plecity (m); F/O Zdenek Skorepa (m); Sgt Stanislav Rous (m); Sgt Karel Weiss (m). Unconfirmed reports suggest that at least some members of the crew died in their dinghy. The aircraft was possibly shot down by Ofw Hans Rasper of 5/NJG2 who claimed to have downed a Wellington at 2230 hours some 3 to 4 miles NNE of Harlingen. DV516 ‘E’ then ‘K’ IC Del to 311 Sqn – Aircraft crash landed on 20/07/42 – then to 6 OTU. DV664 ‘A’ IC Del to 311 Sqn – Heavily damaged by flak 25/06/42 during a raid on Bremen. Captain Sqn/Ldr Josef Stransky. This aircraft was involved in a combat with an Arado 196 on 17/09/42 while on patrol at position 48.00N 06.00W – then to 7 OTU. DV665 ‘B’ IC Del to 311 Sqn – Missing from patrol 18/08/42 shot down by enemy fighter aircraft.The last message received at 1230 hours stated that the aircraft was being attacked by an enemy aircraft. F/O Karel Becvar (m); Sgt Jaromir Drmelka (m); Sgt Jan Lenc (m); Sgt Vladimir Sobotka (m); Sgt Frantisek Sipula (m); Sgt Pavel Tofel (m). DV716 ‘C’ IC Del 311 Sqn – Crashed in forced landing Whetstone Hill, Pembrokeshire 13/10/42. DV738 ‘C’ IC Del to 311 Sqn – (converted to Mk.VIII). Suffered engine trouble whilst on a patrol in the Bay of Biscay and returned to base on 27/02/43 – then to 232 Sqn. DV757 ‘X’ IC Del to 311 Sqn – then to 18 OTU. DV779 ‘L’ IC Del to 311 Sqn – This aircraft was involved in a combat with a Ju.88 in position 47.08N 07.24W on 15/09/42. The enemy aircraft was claimed as damaged. Captain was Sgt Jan Hadravek. This aircraft later crashed on take off from Talbenny 18/11/42 when the flap lever was accidentally touched whilst the undercarriage was being retracted at Talbenny. The aircraft lost height and struck rising ground in line with the runway. DV799 ‘Z’ IC Trans from 156 Sqn to 311 Sqn – Missing from anti-submarine Patrol 12/01/43 possibly shot down by enemy fighters. F/Sgt Miroslav Cervinka (m); P/O Alois Holna (m); P/O Jaroslav Jelinek (m); Sgt Zdenek Janda (m); Sgt Ladislav Kriz (m); Sgt Jan Stiess (m). DV7865 IC Trans from 57 Sqn to 1429 Flt then to 27 OTU. DV883 IC Trans from 57 Sqn to 1429 Flt and then to 27 OTU. DV884 X IC Trans from 57 Sqn to 1429 Flt then to 26 OTU. DV886 ‘X’ IC Del to 311 Sqn – Suffered engine trouble whilst on patrol in the Bay of Biscay on 15/04/43 – then to 7 OTU. DV992 Del to 311 Sqn then to 304 Sqn. HD982 ‘Y’ IC Del to 311 Sqn – Missing from anti-submarine sweep over the Bay of Biscay on 15/09/42.The Wellington was possibly shot down by enemy fighter aircraft. A Wellington was claimed as shot down by Lt Deuper of 13/KG40 at 1732 hours on this date. Flt/Lt Alois Gabriel (m); F/O Rudolf Matejicek (m); F/O Josef Nyvlt (m); Sgt Otto Jerbacek (m); Sgt Jan Neradil (m); Sgt Jan Simko (m). HD988 ‘U’ IC Del to 311 Sqn – Aircraft was attacked by four Ju.88 fighters in position 47.20N 07.10W at around 1335 hours on 11/09/42. Although the aircraft suffered numerous attacks and was badly damaged, there were no casualties amongst the crew. Due to skilful flying and aggressive action by the gunners, the enemy were eventually driven off and at least two of them were damaged. The captain, Sgt Karel Mazurek, was later awarded the DFM for this action. Took off at 0001 hours on 26/01/43 for a raid on Bordeaux. Due to bad weather (fog) the operation was aborted, the crew being unable to locate the target. Captain Sqn/Ldr Vladimir Nedved – then to 105 OTU. HD989 ‘V’ IC Del to 311 Sqn. his aircraft was involved in a combat with two Ju.88s in position 47.45N 07.40W at 1740 hours on 15/9/42 – Cpt F/Lt Bohuslav Eichler – then to 7 OTU. HE113 ‘B’ IC Del to 311 Sqn – (Converted to Mk.VIII) then struck off charge. HE268 X Del to 311 Sqn then to 304 Sqn. HE477 X Del to 311 Sqn then to 304 Sqn. HE576 X Del to 311 Sqn then to 304 Sqn. HE577 X Del to 311 Sqn then to 304 Sqn. HF853 Trans from 214 Sqn to 1429 Flt then to 27 OTU. HF859 ‘R’ IC Possibly del to 311 Sqn. Struck off charge 21/07/44. HF921 ‘M’ IC Trans from 57 Sqn to 311 Sqn – Missing from anti submarine Patrol 29/09/42. The aircraft was attacked by four Ju.88s and was forced to ditch ten miles south of Lands End, Cornwall. Crew spent the night in their dinghy and were picked up suffering from exposure and wounds. Sgt Friedlander the front gunner was killed in the aerial battle. The Wellington was claimed by Lt Walter Berger of 13/KG40 in concert with Uffz Kaltenbrunner of the same unit at 1740 hours. Sqn/Ldr Josef Sejbl (i); Sgt Pavel Friedlander (k); Sgt J Stern(i); F/Sgt V Kubalik (s); Sgt J Bajer (s). HF922 ‘H’ VIII To 311 Sqn. HZ268 ‘Z’ X Del to 311 Sqn – then to 304 Sqn. HZ282 X Del to 311 Sqn then to 304 Sqn. This article is work in progress and regularly updated as new information is identified. If you have any information on these aircraft please contact us here. This entry was posted in 311 Sqd, Aircraft, Information. Bookmark the permalink. Pavel Friedlaender was a friend of my father and lived in Lincoln whilst being accepted for the RAFVR. I was born soon after Paul died and I was named in his memory. Excellent information, many thanks for the memory. Paul: Did your father tell you any stories of Paul Friedlander? Even something as simple as he told good stories? Paul was my grandmother’s 2nd cousin and we’re trying to put together a family history. Thanks! Great job! Thanks for such an informative article.